New York madness is back! 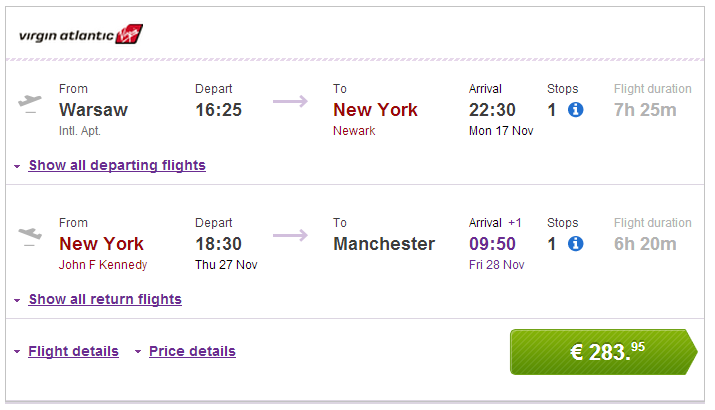 From Warsaw to New York for €307! UPDATE 7.8.: now even better price, €283 from Warsaw (screenshot) and €366 from Prague (screenshot)! The legendary tariff for cheap flights from Poland to USA is back after 2 months. 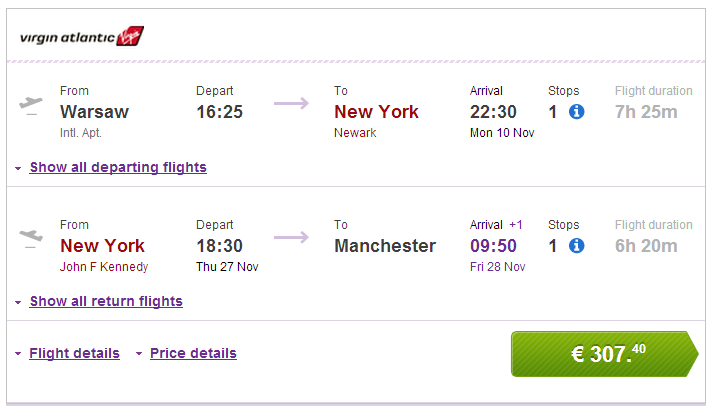 Multicity tickets Warsaw – New York (JFK, Newark) – Manchester are available for only €307 now! Travel dates are from November 2014 till March 2015, from Mondays to Thursdays. Departures are also possible from many other European cities as Prague or Milan for extra fee. Polskibus connects Warsaw with many other cities in Europe. 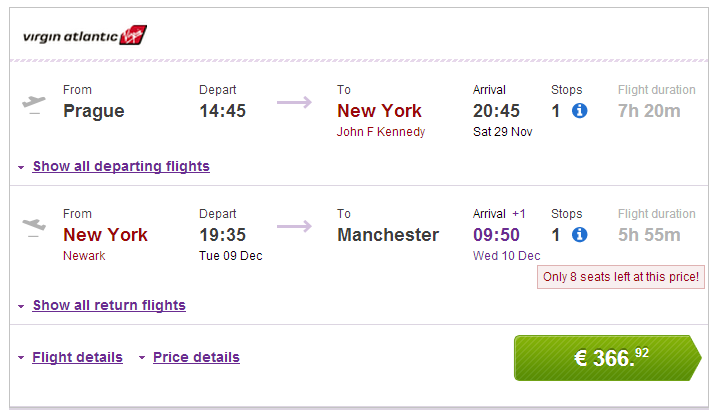 You can also end your journey in London if you dont board the last flight from London to Manchester. Manchester is connected with low cost flights with the rest of Europe. Ryanair flies from Manchester to Warsaw for very low prices starting at approx. €20. You often state, that it’s not necessary to board on the last leg of the flight. However, how is it then done with the luggage? I think it will automatically arrive to the last station. yes, your luggage will be checked-in until the final stop on your ticket. The only option to skip the last segment without problems is to travel only with cabin luggage, then you are free to leave the airport before boarding the last leg. « HIT! Cheap flights to Peru for only €381!